These Crayola Crayon Halloween costumes are a lot of fun and a great idea for a group costume as they come in a range of different colors. I guess that’s hardly surprising as they are based on crayons! Whether you prefer the orange crayon costume or the blue crayon costume there’s plenty of colors to choose from. I think they’re a great costume idea that is bound to bring a smile to anyone’s face young and old because they’re something that generations of people are familiar with. Let’s have a look at the range of different crayon costumes that are available. 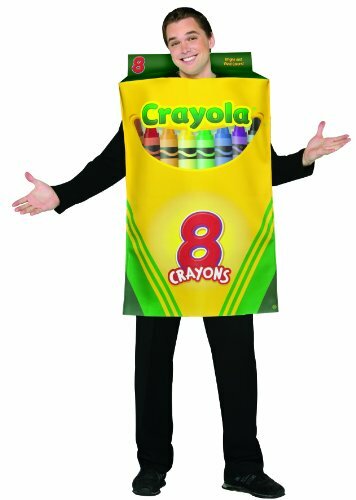 I particularly like the individual crayon costumes, but research would suggest that the box of crayons style of costume is the most popular. As you can see from the image there’s actually three different takes on the individual crayon costumes. I personally love the unisex crayon costumes which you can see in the top row of the picture. This style is available from Toddler age up in a range of colors like the ones above as well as yellow, orange and red. You can dress the whole family up in different colored crayon costumes which should made everyone happy! Of course there are other styles of crayon costumes available and you know that because you can see them on the picture so let’s look at them as well. Sticking with the individual crayons the costumes shown above are both designed for women and include a tank dress style costume as well as a what is called a glitz and glitter tank dress. The traditional tank dress style of costume can be found for a lot of different things such as candy costumes such as twix bars or the individual m&ms as well as board games like tic tak toe and vodka bottle costumes so it’s hardly a surprise to see it as a crayon costume as well. I do like the hat that comes with it, but for me the tank dress is just not very flattering to my figure so I’ll be sticking to the unisex costume! The glitz and glitter tank dress style of costume is a lot of fun and I know a few little girls who would like this style and luckily it is available in girls sizes as well as ladies sizes. The shoulder is more of a boat style and the style of the skirt helps to soften the look of the tank – it looks like a lot of fun! This costume does contain glitter however and this can mean that you find glitter everywhere after wearing it. I haven’t actually tried on these costumes, but reviewers have mentioned that this is a problem and it does appear to be the same material that my daughter had in a flapper dress once which looked fantastic, but dropped glitter like crazy! 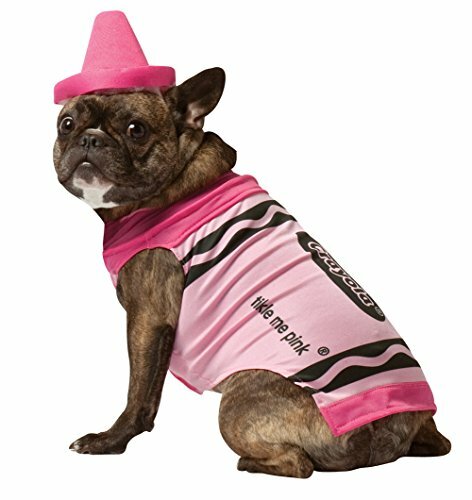 Hold the Phones – There’s a Crayon Halloween Costume for Your Pet! I have only just found this next costume quite by accident and I’m so excited because I think my dog would look awesome in it! You really can dress the whole family up as a box of crayons, fur children as well! This is also available in blue and green which is just as well because I don’t think my hubby would like me to dress our male dog in this pink! I’m not sure the model looks very happy, but I think our ‘little man’ will love strutting his stuff in this costume. Whether he keeps the hat on or not is another story though! These t-shirts are also ideal if you have a husband like mine is a little bah humbug about dressing up in costume for Halloween. Let him wear a t-shirt with a pair of jeans and he won’t feel like he’s in full costume, but the kids will see him as a crayon just like them, although they may be cheeky enough to tell him his costume’s not nearly as good as theirs! 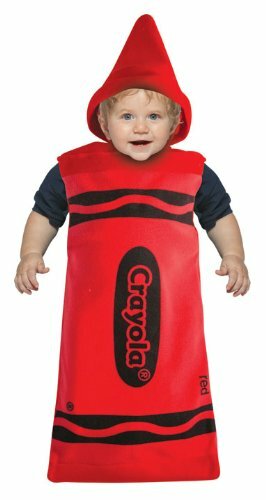 The other costume in the picture at the top of the page is a unisex one of a box of crayons and this has been shown to be the most popular of crayon costumes over the past few years. As a couple you could combine the box of crayons with a sheet of paper for drawing in – basically a big piece of cardboard stuck onto your front! If you’re feeling very creative you could use two pieces of cardboard, one on your front and one on your back – write coloring book on the front one and you now have a crayon inspired couples costume idea! So which crayon Halloween costume is your favorite? I’m going with the purple unisex crayon as my outfit of choice. This entry was posted in Costumes and tagged group costume ideas by Lou. Bookmark the permalink.